As everyone all knows Hugh Jackman is done making X-Man movies. So Logan was the last one and so far it has been getting good reviews. For a last movie its budget was ninety-seven million dollars, the opening day for it was 88,411,916 million dollars which was when it was released on March 3rd, 2017 in theatres and last thing is the gross income which as of yesterday would be 203,861,323 million dollars. It got an 8.5 out of 10 on IMBD which is a website that is devoted to movies. With all of these numbers for a movie that has a long series is impressive on how good it came it because if you look back at other trilogies of other movies like the Alien series its not as good as the first one. The difference though for this series was they stayed true to plot for all of them. The only thing about this movie that seemed out of place was the back history of how they got where they were today because it started with Logan as a car shofar and these guys trying to steal his car. But if you look at some of the reviews this movie got everyone liked it. One of the reviews said, “We finally get the Wolverine we have been asking for, for the past 15 years and it’s his last time. Well I guess he couldn’t have ended it in any better way as a last farewell to the fans and his signature role. Not only that but it looks like this one blows all the other superhero movies out of the water and I hope you Weebs go pay for your ticket to see this as well instead of watching a cam version online so we send the message that we want more of these kind of movies,” the username for this person was aloudibel. There was never a movie until this one came out that involved an emotional Wolverine and that’s why this movie was good and one of the best in people’s eyes. The movie takes place in the near future, a tired Logan takes care of a dying Professor X in some location in the Mexican border. But Logan’s chance of hiding from the world changes when this young mutant girl shows up being chased by dark forces. Together they have to work together. The movie was put together very well. The story line made sense and was very powerful. 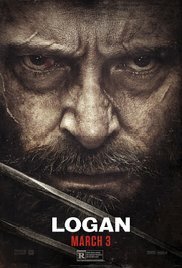 The only thing that I thought was different from it was the violence because in the past the violence has been PG-13 but this movie had a lot of blood and stabbing in the head from Logan. It just was a culture change since in the past the violence was not as graphical as it was during this movie. The question that needs to be asked is will the story continue but with the little girl as wolverine? Because if you have seen the movie the little mutant girl is a little version of Wolverine. So the biggest question coming from the movie is where they will go from Logan. Will this be the end or will they continue from here? “Logan Reviews & Ratings.” IMDb. IMDb.com, n.d. Web. 29 Mar. 2017.